Dr. Dacus joined the department in August of 2007 after completing a fellowship in hand and upper extremity at the University of California, San Diego. His practice has grown rapidly in his time here and his practice continues to encompass joint replacement in the hand and elbow and reverse total shoulder arthroplasty as well as micro vascular surgery of the hand and upper extremity. He is currently working on a research project to study the effect of EMG results on treatment plans/outcomes in patients with carpal and cubital tunnel syndrome. In 2011, he was appointed the Residency Program Director after serving as the Assistant Residency Director from 2009 to 2011. 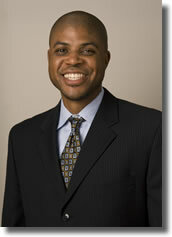 He is also the co-fellowship director for the Hand and Upper Extremity Division. Dr. Dacus has also enjoyed being an Assistant Team Physician for James Madison University Athletics since 2008 and continues in this capacity. Research Description: Tendon adhesion following repair as the process relates the mobilization protocols and the effect of growth factors on repair patterns.